Yes, the garden is driving on towards summer, and there’s not much you can do to stop it. My windowsills are full of trays of seedlings, and so I have been busily pricking out and potting them into pots/plugs in preparation for their final planting out from late May. 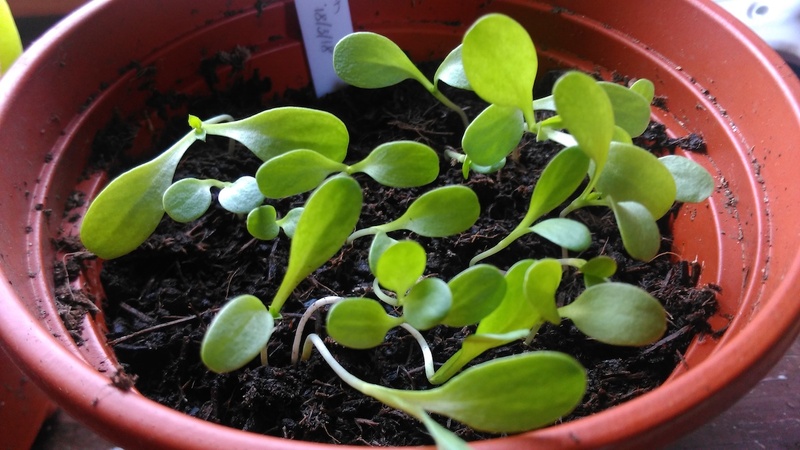 ‘Pricking out’ or ‘to prick out’ is a term used to describe taking an individual seedling from the tray or pot it germinated in, and then carefully planting it in its own pot or plug so that it can continue growing without having to compete with other seedlings. The ‘pricking’ part refers to the precision needed to separate seedlings, and usually requires a small hand device, a bit like a needle, but usually (in my case) an old pencil. 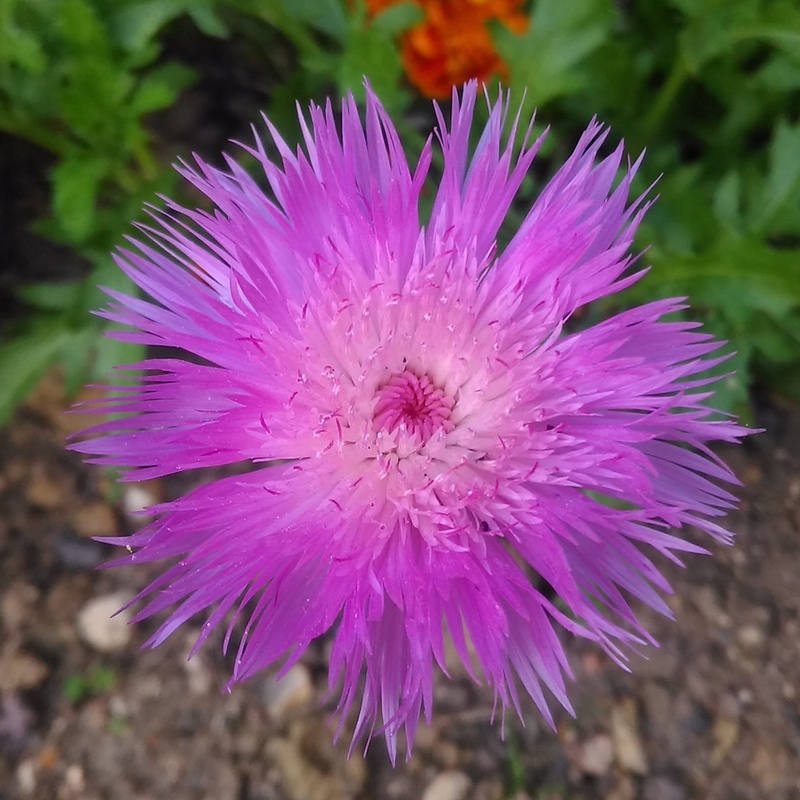 Last year was the first time that I had ever grown Sweet Sultan flowers, after family friend (and keen gardener) Anne, gave me a bundle of seed packets that she’d had from the front of her magazine subscriptions. I’d picked out a few bee-friendly looking plants and sown them. Sweet Sultan ‘Mixed’ were amongst these and they were fantastic, and they looked lovely alongside my Cosmos ‘Seashells Mixed’ plants. Sweet Sultan ‘Mixed’ were wonderful – and a new plant for me in 2017. 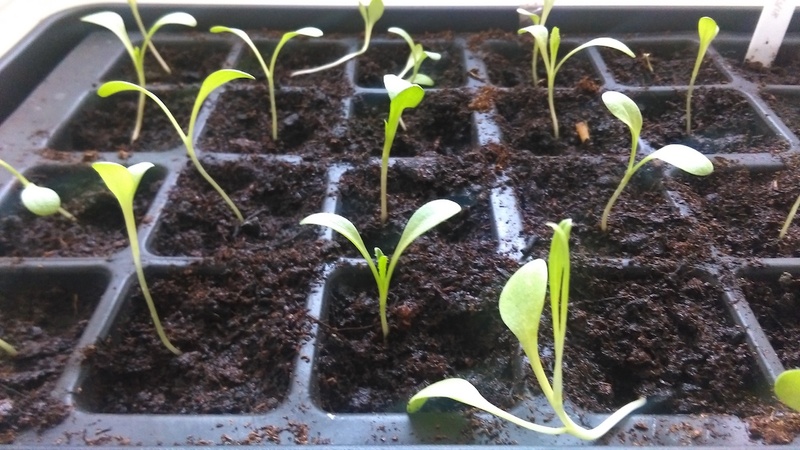 I sowed these flower seeds at the same time as my Swiss Chard, and so they are ready to ‘prick out’. My Sweet Sultan ‘Mixed’ seedlings ready to prick out. With the seedlings all pricked out, they will now be able to continue growing on to their next stage. I managed to grow 22 seedlings in that pot, and so i added two more seeds to fill my 24-plug tray. That will be plenty. Sweet Sultan ‘Mixed’ seedlings all pricked out and ready to grow on. My Swiss Chard ‘Bright Lights’ have been a delight to grow. 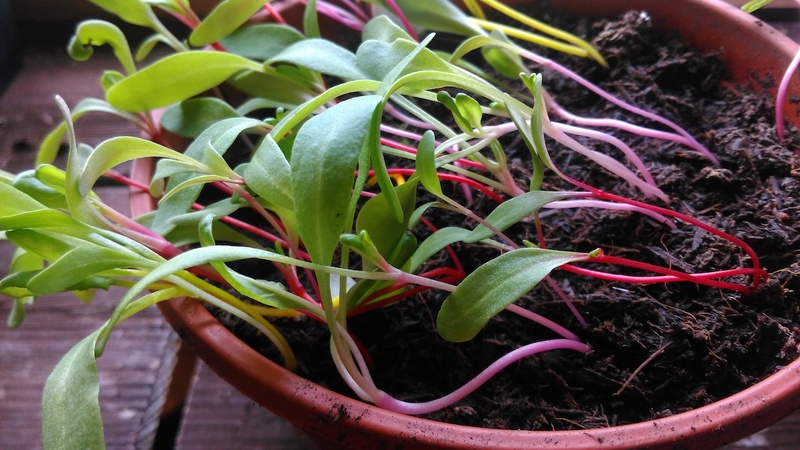 This is my first year growing them, and I have undoubtedly sown far too many and will probably become sick of Swiss Chard by the time I’ve got to about July. 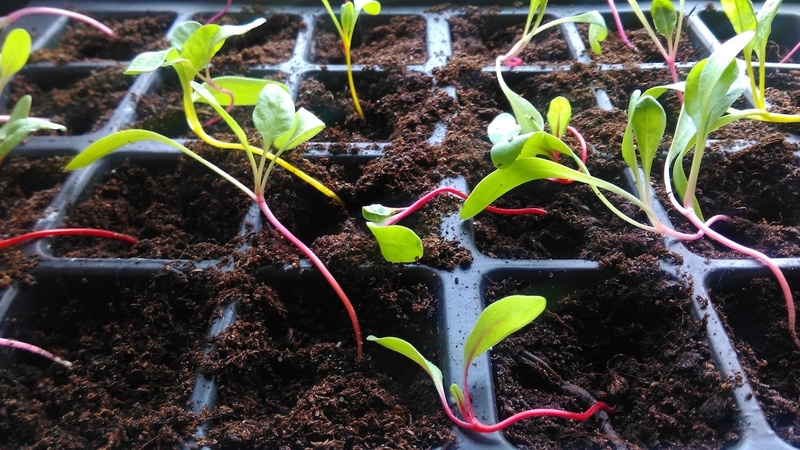 The Swiss Chard ‘Bright Lights’ seedlings were soon up out of the compost. Here they are at 10 days old. However, their brightly multi-coloured stems (almost Rhubarb-like) make them a fun addition to the garden. They’re far from ready to go out yet (they’re too small and tender), but they had to be carefully pricked out so that they could grow on. I think these can often be sown direct, but I didn’t have my raised beds built until I’d been able to get outside to demolish the old shed (that provided the wood, and the ground space for the raised beds) first. Armed with my trusty HB pencil, I dibbered out the seedlings one-by-one, and put them into a plug tray where they can grow into individual plug plants. Once these plants get outside, they’ll soon straighten up, as they’ll grow upwards aiming for the sunshine. 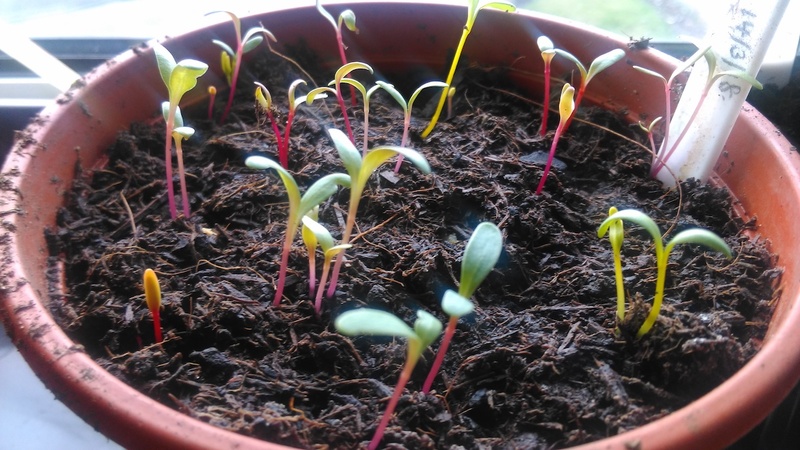 Right now, they’ve grown a lean like most seedlings, as they chase the light on a windowsill. I’ve already pricked out a load of Cleome ‘Colour Fountain’ seedlings, and the Parsley ‘Laura’ seedlings are now potted on too. It’s a productive time, and it’s so important to keep on top of growing as we head through April, otherwise they’ll get behind, or too leggy to be any good. As ever, thanks for reading, and I hope you have a happy gardening week ahead (despite the rain).